2-gang flush-mounted binary input The two inputs can be assigned various functions or blocked independently of each other in the process. 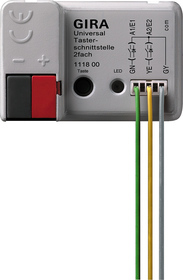 Both inputs can be configured as outputs (max. 2 mA). Free assignment of the functions switching, dimming, blind and value transmitter to both inputs or pulse counters and switching counters.